A state contract worth up to $250,000 to study the future of Alaska’s ferries is on hold. Two Anchorage firms are vying for the contract: Northern Economics bid $249,887.54 for its proposal; MAP Consulting LLC bid $224,888 — roughly $25,000 less — for its proposal. But the low bidder, MAP Consulting, filed an appeal after being passed over. Cost is weighted as 40 percent of a proposal’s score but there are other factors. That puts the brakes on the process as skeptical lawmakers in coastal Alaska raise questions. The legislature doesn’t have the ability to intervene directly but that hasn’t blunted criticism from districts most served by ferries. Ketchikan independent Rep. Dan Ortiz said he’s concerned about the administration’s focus on privatization. The future of ferry service still remains in question. 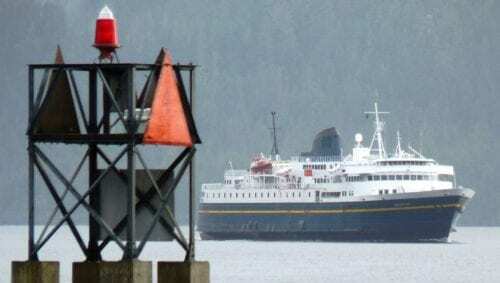 The Dunleavy administration argues that the ferries are losing too much money and proposed ending service in October. The House rejected that plan but still slashed about $10 million from the ferry’s budget. Attention now shifts to the Senate.